GORGEOUS MINI FARM WITH 3.10 ACRES OF PERMANENT PASTURES AND A PARK LIKE SETTING. LARGE HOME WITH CATHEDRAL CEILING AND A ROCK AND CEDAR WALL AND FRENCH DOORS IN LIVING ROOM. WALK IN PANTRY IN NICE SIZE KITCHEN. LOTS OF TILE AND CLOSETS. NICE MASTER SET UP WITH JACUZZI, TUB, HIS AND HERS VANITIES AND A SEPERATE SHOWER AND TOILET! EXTRA BONUS ROOM COULD BE OFFICE OR WORKSHOP. SCREENED PATIO AND A 600 SQ FT BARN WITH ELECTRIC RUN TO IT. NEW ROOF .. THIS IS A REALLY UNIQUE PROPERTY SEE THIS ONE! 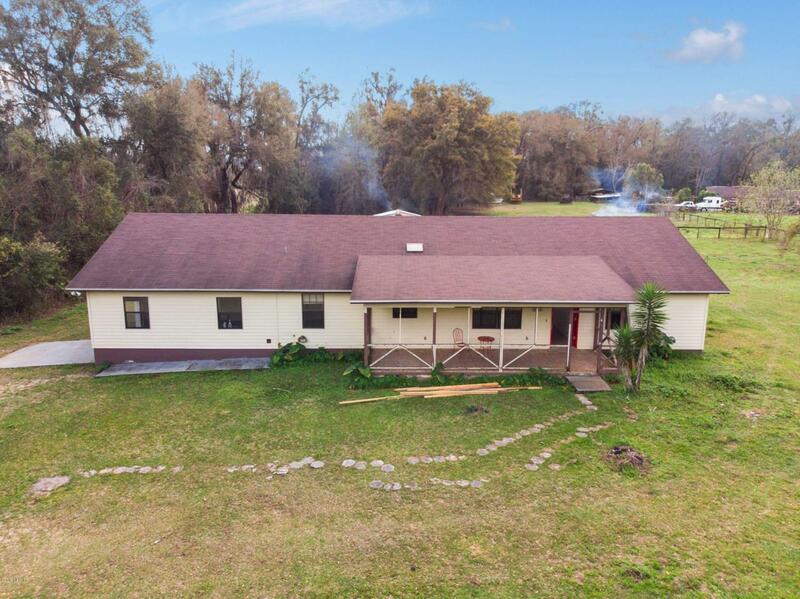 Listing provided courtesy of Aleida Tamayo, Pa of Ocala Key Realty, Inc.